In 2000, Microsoft announced a new Software development framework for Windows called .NET in the Professional Developer Conference(PDC). Microsoft release PDC version for Developers to test in the version of Beta 1 and Beta 2. Both of the version thrown to open community to test and lots of changes has to be done. Finally, in march 2002 Microsoft release final version of the .NET framework. Future development involves new and upgraded version of the framework. What type of application can you develop through .NET Many Internet and networked application. ASP.NET Web application: These include Dynamic and Data Driver Browser application. Windows Form based application: Client application. Console application: Traditional DOS kind of application like batch scripts. Web and Window Custom control: Web control allows to develop your own window controls and web controls are extended to custom control to the web. Web Services: “Well callable” Functionality available via industry standards like HTTP, XML, SOAP. Window Services: Application that runs as services in the background. Use for creating all kinds of application that you find under Windows. To develop varied types of application, .NET has a complete Software Development Kit (SDK) that provides classes, interfaces and languages. This Framework is available free of cost, you can download it from MSDN website. If you are developing an application simple notepad may not serve the purpose for that we need to require the new Visual Studio .NET is such an IDE. Productive features of visual studio like: drag and Drop design – IntelliSense Features –Syntax highlighting and auto-syntax checking-Excellent debugging tools – Integration with version control software. It comes in different editions you can select different edition in the kind of development you are doing. Following editions are: Professionals-Enterprise Developer –enterprise architect Visual Studio. Developers can use the professional edition to create solution that span any device and integrate with any platform, features include collaborative team development, third party tool integration. The additional feature includes a visual designer for XML services. Rich Functionality Out of the box: Contain hundreds of classes for that developer need not to go low level details. Easy Development of web application: the grid of coding from the programmer's side because ASP.net provides event-Driven Programming language and server controls. Multi language support: When enterprise have varying skill sets with the visual basic, C++ so you need not to throw them you can mold them in any language suitability. Currently VS.NET supports 20+ programming languages. Compatibility with COM and COM+: You can still use COM components and ActiveX controls. .Net relies on COM+ for transaction management and object pooling. Ease of deployment and configuration. At the bottom there isOperating Systemwhich wrap up with the .NET, Insulating software developed with .NET from most Operating System specifics such as File handling and memory allocation. Common Language Runtime(CLR): This is the Execution environment consist heart of the .NET framework. .NET applications are compiled to a common language that is also known as Microsoft Intermediate Language then CLR handles the compiling the IL to machine language that time Program is executed. In such kind of environment common services, garbage collection and security are provided automatically. .NET Class Framework: Also referred as .NET base class library it consist of several thousands of type definition and each type exposing their functionality. CLR and Class Framework allow developers to build following type of application: Web forms, window forms, Window console application, window services. ADO.NET: It is Microsoft next generation ActiveX Data Object that heavily dependent on XML for representation of data. It DataSet Object is the core component of ADO.NET architecture. User Interface: This layer allow user to interact with the outside world. Some type of interaction interfaces supported by .NET framework: Web forms, Window forms, Web services. ActiveX server pages has undergone extensive changes in ASP.NET: New support for HTML server control, It is now possible for server to process client-side events, New Control families with enhanced intrinsics. Languages: CLR allow object written in one language be treated as equal by code written in another language to make this possible Microsoft has defined a Common Language Specification and language that conforms CLS can run on CLR. 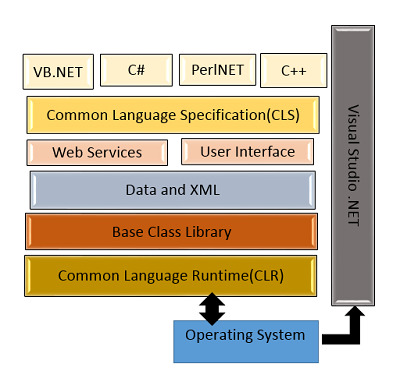 In .Net framework languages are Visual Basics, Visual C++, Visual C# and JScript support. Find The Best solution of .NET Topics.